Redondo Residents – do we want to be part of L.A. County Fire Department and give them control of our Fire Assets? Or do we want to keep our Redondo Beach Fire Department? Our RB fire department has brand new trucks and equipment. 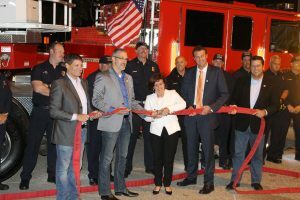 The Board of Supervisors unanimously approved a $4.5-million plan Tuesday to reduce the strain on the Los Angeles County Fire Department, which responds to devastating incidents such as the Woolsey fire but also provides 24-hour emergency services across 2,300 square miles. The supervisors’ plan seeks to educate the public and leaders in the 59 municipalities the department serves about the “new realities” in staffing, equipment and facilities — and to gather their input about their experiences during recent fires. The new effort comes months after the board raised concerns about the department’s aging stations and equipment, and weeks after the Woolsey fire burned more than 90,000 acres in Los Angeles and Ventura counties. The supervisors said the fire has highlighted a new reality for the department: It must respond to wildfires in an era of drought conditions and prolonged periods of dry, windy weather while also providing emergency medical services to 4 million county residents. The board’s move also comes amid new scrutiny about the department’s payroll after the county’s chief executive officer, Sachi Hamai, asked the auditor-controller to examine its overtime practices. The Times reported in October that more than 640 firefighters received at least $100,000 in overtime in the 2017 calendar year as commanders struggled with staffing vacancies and the demand for fighting wildfires. The report also found that two dozen firefighters made in excess of $200,000 in overtime. The audit began in September and was expected to include interviews with department management about payroll and timekeeping to ensure that overtime spending complies with guidelines. Auditors were expected to review some of the top overtime earners and study whether the department has a process for receiving some reimbursement when it helps other departments with emergencies such as wildfires or hurricanes. 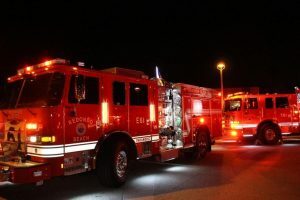 The report is scheduled to be completed later this month, though it’s unclear whether the department’s full-blown response to the Woolsey fire might delay the outcome. Fire Chief Daryl Osby, who was appointed in 2011, told supervisors that his department is already among the busiest in the nation, behind New York, Chicago and Los Angeles city, he said. The department responded to more than 400,000 calls last year, he said, and roughly 80% were to address emergency medical needs. Only a fraction of the calls relate to actual fires — but incidents such as the Woolsey blaze expose lingering concerns about the department’s staffing and equipment. The county has already identified the need to upgrade the department’s communications system and infrastructure, including breathing apparatus, fire engines and helicopters. Fire Capt. Dave Gillotte, who directs the union representing the department’s 3,200 firefighters and paramedics, said the department should focus on hiring more firefighters and paramedics — including more women. “An integral part of this will be the recruitment of candidates from out there in our communities,” he said.